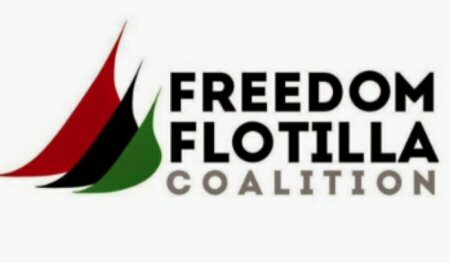 Freedom Flotilla was intercepted by the Israeli navy on Sunday afternoon, approximately 70 miles from the Gaza Strip shore. Israeli Navy Forces stopped the ship in international waters in violation of international maritime law, after shouting toward the boat via loudspeaker and asking for the boat’s destination. In a statement, the High Committee for Return and Breaking the Siege called upon the international community to take its responsibility and provide the necessary protection for the Freedom Flotilla Fleet, while also promising increased efforts to break the siege. “We will move in all directions until the world is convinced that there is no alternative to breaking the siege,” the Committee said. Zaher Birawi, head of the International Committee to Break the Siege, said that Egyptian Coast Guard ships sailed behind the fleet throughout the night for a certain distance. “Apparently a normal security measure,” he said, according to the PNN. There are 45 International Solidarity Movement activists from approximately 15 countries aboard the fleet, along with the media teams for correspondents from Al Jazeera and Press TV. In a letter to the British Minister, British Foreign Secretary Jeremy Hunt called for an intervention to protect ships from Israeli aggression. Two participants on the return ship are British nationals, Press TV’s Richard Sowane and Sui Ang. Israeli authorities consider Freedom Flotilla efforts illegal under international law, and have decided to seize any other ships that will try to break the siege against Gaza, including the Norwegian Fleet that is set to arrive in a few days.